Vancouver is a beautiful, bustling city with an abundance of charm and opportunity. To appeal to the technologically savvy population, Dr. Shehla Ebrahim and Dr. Christopher Pavlou of Afterglow Physician Directed Medical Aesthetics reached out to Rosemont Media’s team of experts to upgrade their practice website. The experienced physicians offer a comprehensive selection of innovative skincare treatments, and they requested a modern, convenient, and welcoming design to correspond to their office philosophy. The result is an improved site with state-of-the-art features, including an adaptable format, original content, and a sophisticated, easily navigable layout. 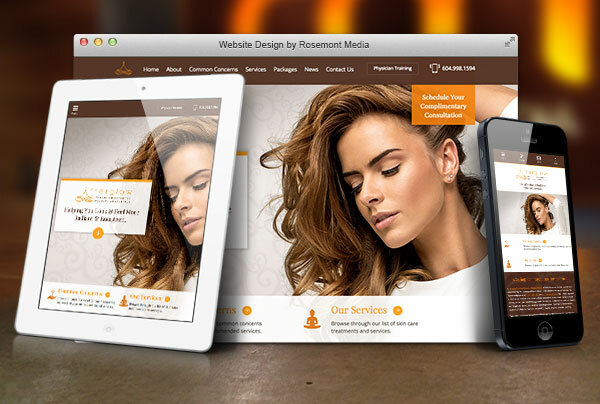 Primary among the updates is the responsive website design. Current and prospective patients can view procedure information and schedule a complimentary consultation from virtually any Internet-compatible device. Smartphone, tablet, and laptop users will notice the dimensions of the site automatically adjust to fit the size of their screen. Additional attributes include a page in which visitors can select from an interactive list of common facial aging concerns—indicated on a graphic of a woman’s face—to learn more about skin conditions and discover advanced treatment options. Rounding out the website’s many cutting-edge renovations are the fixed-image background on the homepage, convenient drop-down header menu, and inviting color palette. To help the practice stand out among the competition, Rosemont Media also equipped the website with leading medical SEO strategies. As a result, the site enjoys enhanced visibility in its online marketplace. Now the Vancouver skincare office can receive the attention it deserves, and patients can easily access the information they’re seeking. We encourage you to visit afterglowskincare.ca to view an example of one of Rosemont Media’s customized website designs. For more information, please browse our expansive portfolio or contact us today for a quote.